How Are Bing Ads Evolving? Search Engine advertisers can now add callout and review extensions to Bing Ads. Last week, Bing rolled out this feature to everyone, with the exception to Hong Kong & Taiwan. In both their campaigns and ad groups, users are able to add up to 20 call out extensions. For extensions to show at all, there must be at least two call-out extensions set up. The format in which these extensions are shown can vary. 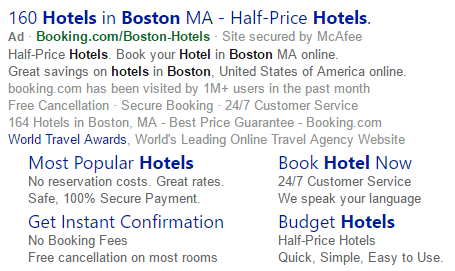 In the picture below you can see one with dots(starting with “Free Cancellation”) and one with dash separators (starting with “164 Hotels in Boston, MA”). Review Extensions are used from online review based websites. The review must come from a trusted and well established source and when click on, the advertiser is not charged. Reviews can also be paraphrased but must accurately match the review. Being the second tier search engine to Google, Bing is continuing to improve and make changes. From recent updates on Android & iOS Apps to launching a keyword planner it will be interesting to see what move they make next.